Plenty of parking spaces even at 11.00 meant the public were Christmas shopping rather than shopping for cars today. But BCA put on a full sale, giving dealers and fleets a second-last chance to get stock off their books before the year end. Last chance realistically will be Friday when BCA will runs another full programme including entries from PHH, Fleetlease, Lloyds TSB Autolease, Vauxhall Masterhire, Interleasing and Inchcape, plus the usual LCV sale. Today’s hot little numbers included Black Horse 17, a repossessed 49k mile unwarranted 2000W Honda Integra R for which there is a huge demand among the Fast and Furious Max Power brigade. 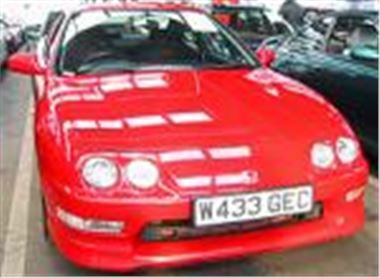 This one sold for £8,350, while another quick Jap, a 45k unwarranted 99T Nissan 200SX sold for £6,350. Coming up behind them, with a mere 140bhp, a sweet black 25k unwarranted 2001X MR2 sold for a level £11,000. Spectacularly low provisional bids of the day included £7,300 for 12k mile 02 new-shape Primera 1.8S; £6,000 for the almost unsaleable 7,500 mile 2002/51 reg Lupo 1.4 TDI Sport in Fantasie Green (right car; wrong colour); and £5,300 for a 5k mile 2001Y Rover 25 1.8L Steptronic. But £10,250 provisional wasn’t as low as it seems for a 900 mile 02 Peugeot 206 2.0 litre Coupe Cabrio because it needed a lot of new panels at the front. A 5k mile 02 reg Golf TDI PD 130 5-door 6-speed (but with standard 195/65 rubber) bid to £12,700 and a 5k mile 52 reg Passat TDI PD 130 SE 5-speed bid to £14,550 which seemed a bit high to me because you can almost get a new one for that. Bargain of the day simply had to be a 49k unwarranted 96P Daewoo Nexia 1.5GXi, for which you can now get spare parts (from www.gmdaewoo.co.uk), and which sold for a level monkey. Remember, business as usual on Friday 20th, but Blackbushe is then closed the entire working week Monday 23rd to Saturday 28th. There will be sales on Monday 30th, Tuesday 31st and even on New Year’s day for anyone who wants to get an advantage over the partygoers. For information of upcoming BCA auctions, visit www.bca-auctions.co.uk From this site you can now log in to Auction View as a guest and use the stock locator to find the car you want at any BCA centre. Full list of auction centres throughout the country at www.honestjohn.co.uk (go back to the home-page and click on auction directory).